← I’m All Sally Fields. You see, yesterday it rained. Cats and dogs. Which called for my cordovan double soled storm shoes. 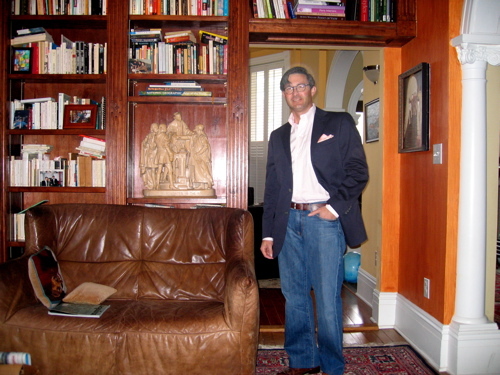 I really had only one “errand” to do outside of the manse and thought that I might wear a pair of jeans, as I was sure to get wet and it was predicted to be a very warm day and really I was only going to pick up my daughter from pre-school before returning to some spring cleaning… . The jeans don’t see the light of day much. They are “designer” (7 for All Mankind) and fit well enough. But I feel kind of Mick Jagger in them. And my 80’s prejudices against designer denim have deep roots. Well, I dressed out after exercising and came downstairs to read through email, check on a favourite blog or two, and there was Mr. Will’s article front and center on the electronic desktop. Blame the Italians, who look so stylish in jeans (I can’t break out my white linen just yet), or my laziness on a dreary day. Blame my increasingly casual point of view as a telecommuter if you must, but the blame rests squarely on my shoulders. It was a sartorial moral lapse. There are more than enough sources of denim coloured inspiration on which you may draw. You don’t need more here on Easy and Elegant Life. You’re good enough at jeans already. The trousers don’t fit very well on this cotton number, but as a knockabout suit, it would suffice. 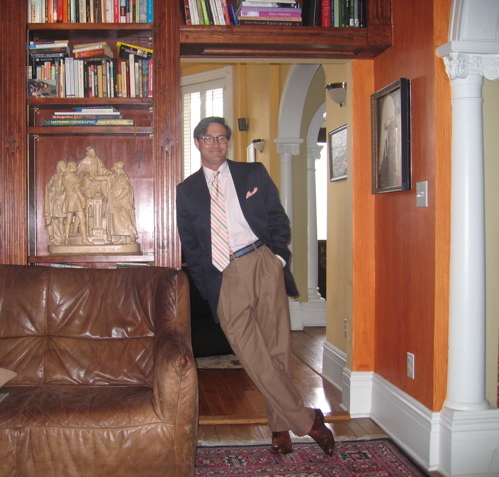 Ditto for the cotton brown and cream glen plaid trousers, but they are comfortable. I know I’m rushing things with the summer tie, but it brightened things up (as did the ribbon belt) on a grey day. The trick, you see, isn’t wearing casual clothes; it’s wearing clothes casually. This entry was posted in Elegantology and tagged Fred Astaire, George Will, Sean Connery. Bookmark the permalink. Love the third look, but all three are great. Dark denim Levi’s 501 jeans are the way to go. Try a pair before giving up on the lowly-jean! They have a rich history, staying power, simplicity of design, and remain the only extant 19th century pants pattern that is still mass-produced today! I vote on # 3 also, howwever I do like the look of jeans with a blazer these days. Of course being in the art world, even Events and Opening receptions have become quite casual. I share your bias against ‘designer’ blue jeans. All of those dreadful logos, hardware, weird pockets, etc., made for a sad decade. Even the Calvin Klein jeans were contrived looking. The men in my family–ages 50-something and 21–both wear Levis. Good quality denim, classic design. For myself, I swear by Gunex. Italian, perfect fit, launder great (we discussed that once already, but remember, cold water, hang dry, no iron). Actually, Gunex are unquestionably the best fit in ladies trousers on the planet. Expensive, elegant, worth it. Their ladies’ little grey wool cuffed numbers are perfect with a white shirt and a great brown belt, a Tod’s driving moc. Add the Hermes scarf, and you’re set! P.S. Third look was my favorite–relaxed and elegant. Having travelled a lot this Spring, I would love to hear a conversation about what to wear on the day of travel. Especially given the fact that the planes are now dirty, one may spend the better part of a day in a terminal, and what does one do when you leave one climate and arrive in a very different one in a period of four hours–and what about shoes (and socks) now that we have to remove them at security check points. My husband, when he travels with clients, says taking off his shoes in front of clients and standing there in his stocking feet sort of changes the relationship–and not always in a good way! What would Cary Grant do??? Being a Californian, I second the Levis 501s, the original jean, the only brand I have ever worn. Levis 501s also influenced the look of trousers from the 1960s on. Except for the jeans look, I do like all of your other choices and even though Los Angeles is known for its casual style, you are inspiring me. Thank you. If you watched Topper last night, I guess that he would trade shoes with said client! I always ask myself, “What would Jane Austen do?”. Hi Paula, it’s a question of layering, slip on shoes (Belgian slippers work best), dark socks that look as if you’re still wearing your shoes… or a private jet. 501’s… hmmm.. not since the days at the 9:30 Club …. . 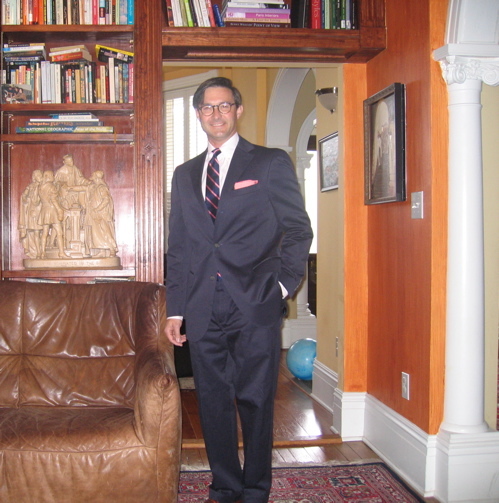 It was 501’s or a vintage 60’s grey worsted suit with a slim jim tie and white button down of the same era. My waist was also four inches smaller. I agree with Paul regarding the gunex jeans. Fabulous. Regarding travelling I wear these same jeans, some kind of flat shoe (Tory Burch is really comfy – I walked all over Beijing in them!). If the trip is not too long , I wear a white shirt and a jacket or cashmere cardigan. Great leather carry on and I’m done. With jeans priced from $12.00 for a pair of Wranglers to $200.00 for designer jeans and now designer jean stores are opening up from Las Vegas to New York, looks like they are here to stay. Who would ever think the blue jean would get so popular when Strauss started his business? I heart jeans. That is all. Jeans jeans jeans.